Councillors of the Central Desert Shire – black and white – say the shire system time needs more time to prove itself. Most of those I spoke to will put their hands up again for election in March, including shire president Norbert Patrick. He says he would accept the leadership role again if asked, but would rather be just an elected member who could give new members the benefit of his experience. I spoke to the councillors outside the chamber after they had met for the last time before the election. During the meeting shire CEO Roydon Robertson had raised the recent negative comments made about the shires by Aboriginal and Torres Strait Islander Social Justice Commissioner Mick Gooda, angrily dismissed by the CEO as “another insult”. Mr Gooda was reported by the ABC to have called for the shires model to be scrapped, referring to its “total detrimental effect” on communities. Councillors appeared to be in agreement with the CEO and the sentiments expressed by Kerry Moir, president of the Local Government Association of the NT (LGANT), who was appalled at Mr Gooda making such damaging statements just two months out from the shire elections. She has called for Mr Gooda to meet with LGANT and the shire mayors – all of whom in the large shires are Aboriginal – and this is to occur on February 21, with both Cr Patrick and Mr Robertson attending from Central Desert Shire. Outside I asked Cr Patrick what he thought was good about the shire. “Getting Indigenous and non-Indigenous to work together, making the shire better for people in our community and our region,” he said. What has improved in Lajamanu, his home community? I asked him whether he thought people felt a loss of control over their affairs as a result of the shire system replacing community government? Are people in Lajamanu happy with the system? “They’re still not sure how the system works within the shire but we’ll have to work with the shire to make it better for everybody who lives at Lajamanu and in bush communities. “Very hard to change it back, the shire is here to stay for a long time. They need to work with it and make it happen, both together, the community and the shire. Can the local boards tell the shire what they want and get things done? Local board members are “very important people”, says Cr Patrick. Cr Patrick, as president, attends local board meetings around the shire. Does be believe the board members are happy with the system? This goes too for new councillors. They need “a lot of introduction how the council normally runs. Not easy. In my experience it took about three years to learn how the system works”. This is no mean commitment for Cr Patrick. Lajamanu is at the far northern end of the shire area, a good 10 hours drive from Alice Springs. Council business takes him away from home for weeks at a time. What has he been able to achieve while on council? Is Lajamanu better off since the shire was created? Was the old community government system better? What would be most important for shire to achieve in the next term? Councillor Peppi Drover is choosing employment over representation. 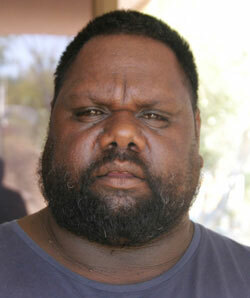 He works for night patrol at Engawala and under new rules shire staff cannot be elected to council. Has the shire been good for Engawala? “Work, jobs, couple of new buildings, basketball court, takeaway shop, kindergarten next to basketball court. Did people like the old system better? Does the local boad tell him what they want? Councillor James Glenn from Ti Tree will stand again for the Anmatjere Ward and expects there’ll be other candidates putting up their hands. How have things improved in Ti Tree under the shire? Does he think people prefer the old community government system? But Cr Glenn also thinks that people’s opinions of the new system are influence by “what happened with the Commonwealth Government”, ie the Intervention whose impact began to be felt at roughly the same time as the shire was introduced. In contrast to MacDonnell Shire, whose councillors are all Aboriginal people from communities, Central Desert Shire has three non-Aboriginal councillors. Councillor Sascha McKell lives at Yuendumu where she is employed by the shire and so will not contest the next election. 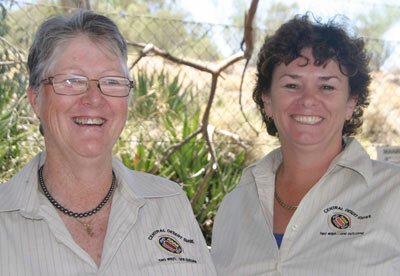 Councillors Dianne Martin and Liz Bird are both cattle station people and both are considering standing again. Cr Martin, of Mount Dennison Station, was elected when a vacancy occurred after 12 months. She does not see station people as her only constituents, however. She works on communities and feels she has “a broad understanding” of their issues. Cr Bird, from Indiana Station, was encouraged to join by Cr Martin, whom she knew from School of the Air days. She was elected unopposed to fill a year-long vacancy in the Akityarre Ward. Both see local board meetings as an important way for them to have contact with community people in their ward and for the shire to know what people on the ground want. 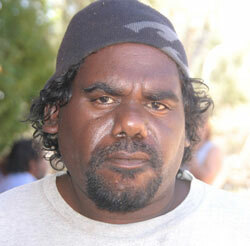 Cr Martin, who attends the meetings at Yuendumu, Willowra and Nyirripi, says the majority of members are usually there and the system has “definitely improved”. Cr Bird says she’s met capable people at the local board meetings in Atitjere who were involved with community government. Station issues are obviously close to her heart but Cr Bird sees a role for her to get more shire information out to all the people in her ward, whether they’re on communities or more isolated on pastoral and mining leases, agricultural ventures or other businesses. She’d like to see the diversity of these interests reflected in, for instance, the shire newsletter, which is dominated by community news, and will work to make that happen. If she runs again, what does she hope to achieve? “I’ve been on council not even a year, so I guess consistency. I’ve learnt a lot, so to continue that knowledge onto the next council – you do need time to understand it all. Are they feeling more optimistic about shires now that they’ve had close experience of them? How is their relationship with their fellow councillors? “Very good,” says Cr Bird, referring to the “really lovely letter” that one of them had sent to apologise for being absent from this last meeting, in which he thanked various of his colleagues for having been his mentors. “It’s little things like that, people coming up and shaking my hand, saying thanks very much, nice to know you. I think people appreciate the time you’ve put in, especially someone like myself who has nothing to do with the communities. People were wary of one another in the beginning, says Cr Martin. What will the big issues for the new council to deal with? 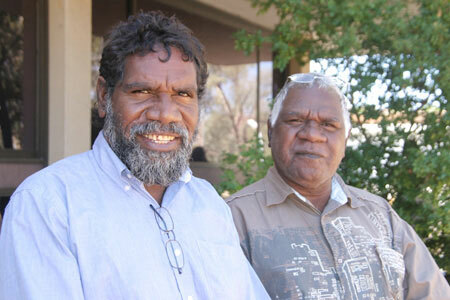 Pictured, from the top: Shire president Norbert Patrick and Councillor William Johnson, both of Lajamanu, outside the shire head office in Alice Springs last Friday. • Cr Peppi Drover from Engawala. • Cr James Glenn from Ti Tree. • Crs Dianne Martin and Liz Bird, from Mt Dennison and Indiana Stations respectively.